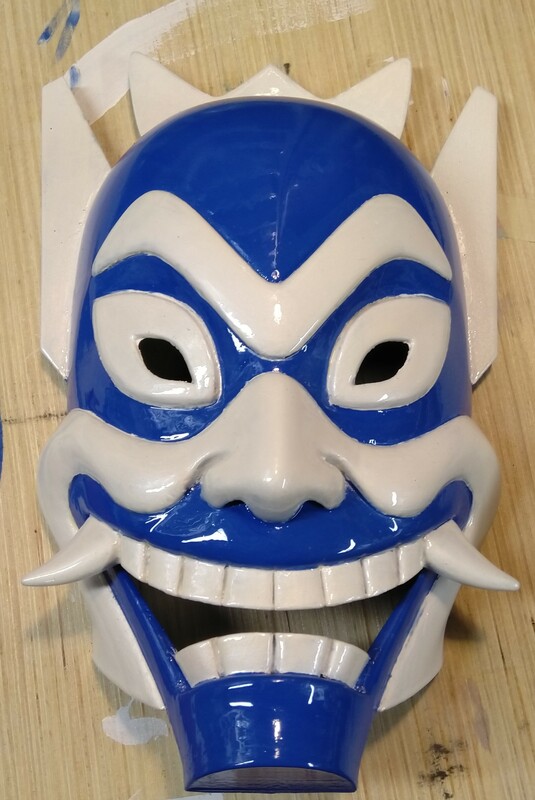 Yet another mask to add to the collection, this one is the Blue Spirit mask from Avatar. I found a very lovely model on thingiverse and was able to print it in one piece in PETG with .2mm layers. I did something a little different this time though, I wanted this mask to actually feel like something solid, so I lined the interior of it in clay before I covered it in putty and began sanding. Once the large layer lines had been removed I start laying down filler primer and sanding to 200 in between coats. The Wolf mask is from another project I was working on at the same time. Next up comes the spray paint and the detailing work. I used Rustoleum Brilliant Blue 2-in-1 gloss paint and laid down 5 coats to get it glassy smooth. After that had dried I did a rough painting of some white metallic hoping I wouldn’t have to mask it off, but my old hands are getting too shaky so out came the painters tape. Once that had dried I went to town with some gloss polyurethane and just laid into it to get a nice shine and ceramic look. Thanks for reading!